Rock Band 3's pro mode will finally put the argument over guitar games vs. real guitars to rest. Rock Band 3 will help you learn to play the guitar, or at least, its pro mode will. Pro mode throws out the five colored buttons of the previous games and adds on-screen prompts that are much closer to standard musical notation. This will go hand in hand with new guitar controllers that will actually have strings to strum. There will also be new cymbals for drummers to master, and harmonies for vocalists. The game's regular mode is getting an update too. 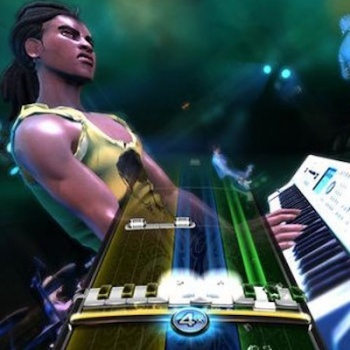 Aside from adding keyboards to the mix, Rock Band 3 will let seven people play at the same time, and includes a system where players can drop in and out of songs without bringing the overall performance to a screeching halt. It also has Bohemian Rhapsody in it.